Sunday Seminars are Hot Topics! Help Preserve History by Owning it! Mark your calendars - All of the following events will be occurring at/near the Graffiti House soon! The Brandy Station Foundation with the Germanna Community College are hosting a Symposium on the Great Winter Encampment on March 24, 2007. We invite proposals for papers or other presentations on any other aspect of the Winter Encampment or events that took place in and around Culpeper County during the winter of 1863-64. Papers and presentations will be 45 minutes long, followed by a brief question and answer session. If you would like to be a presenter at the Symposium, please submit a proposal, no longer than 750 words, postmarked no later than November 27th, 2006 to: the Brandy Station Foundation, P. O. Box 165, Brandy Station, Virginia 22714. For more information click here. Recently, the Brandy Station Foundation was the recipient of a wonderful historical gift! Through the auspices of Stevensburg District County Supervisor Bill Chase, Mr. Wayne Mills donated his collection of the Official Records (OR) of the War of the Rebellion. The collection, encompassing 127 of the 128 original volumes and some 18-24 cubic feet of knowledge, will now provide a firm basis for historical civil war research at the Graffiti House. As a bonus, this set of OR volumes was originally printed in 1891 and originally given to then Congressman F. L. Coombs of California, whose name is embellished in gold leaf on the spine of the books. With this marking, the OR is quite a historical artifact by itself. Thank you Wayne and Bill! During the winter of 2005-6, your Brandy station Foundation (BSF) was able to do two things it had never done before. First it was able to save, virtually single handed, a prime piece of Brandy Station battlefield land - the former Golden Oaks property at the foot of Fleetwood Hill. Second, within just a couple of months, the BSF was able to purchase another prime piece of battlefield property - but this time at Kelly's Ford. These purchases were made in your name and were generously supported by you. However, I am disappointed to say, we are still about $25,000 short of having enough money to pay the mortgage on the properties. The money, although significant, is not great - but in concert with other outstanding mortgages/operational costs from the Graffiti House, the debt creates a situation where the BSF has a very limited flexibility for the future. When we look around Culpeper today, we see a county in the midst of a great transition. What the future will bring we do not know - but what we can anticipate is that the future will be significantly different than what we have experienced previously. The best way to combat the uncertainties of this future is to provide ourselves with the maximum amount of flexibility for our affairs. This flexibility can be provided by successfully ending our most outstanding debts - such as the $25,000. As you can see by this and our past newsletters, this organization is doing significant work to preserve America's heritage in Culpeper County. We can best continue these works by taking action to put ourselves in the driver's seat for our future. Minimizing our debt is one such effort we can do to help ourselves - but we need your support. Will you help? Click here for information on donations and membership. With popular emphasis on SOL test results, time constraints forced by block scheduling and the increased price of fuel, field trips have been discouraged by many schools. With the knowledge that they do not have to drive to Washington DC or Williamsburg for a valuable out-of-class experience, many of the teachers are already planning to incorporate the Graffiti House in the curriculum. Additionally many high school social studies teachers require community service hours as part of the grade for graduating seniors. The Graffiti House provides a wealth of opportunities for contributing to the public in our area. The annual Meeting for the Brandy Station Foundation will be held March 2nd, 2007 at the Brandy Station Fire Hall. The event will last from 6:30 to 9:00; our speaker will be Joe McKinney and the food will be great and there will be lots of it!! Don't miss it! Interests have been as keen as the weather has been hot for the BSF Sunday Seminar series! The series began on June 25th with a thought provoking presentation by Dr. Dan Beattie on the Dahlgren-Kilpatrick Raid on Richmond in 1864. Dan brought to life the personalities of the main participants as well as the operational difficulties that both armies faced in trying to achieve and/or defend the raid! As to the main question - who knew what and when -- you would have had to be at the Graffiti House to get the answer. On July 30th, Brigadier General John DePue (Retired) shared the trials and tribulations of the men who fought as the 1st New Jersey Cavalry. Beginning at their enlistment, General DePue discussed the men, their leaders and the leaders shortcomings as they advanced through the war to the June 9th,1863, Battle of Brandy Station. The old saying – “we have met the enemy and they are us” - takes on special meaning when placed in the context of this very interesting - but flawed, regiment. On August 27th, Ms. Faren Wolter of the Piedmont Environmental Council, ably seconded by Culpeper legal eagle "Butch" Davies led a fascinating discussion concerning strategies available to protect Culpeper's History through Virginia Land Preservation Tax credits. Speaking to a group of 25 interested parties, the discussion was spirited and interesting as well as hopefully useful to the participants. 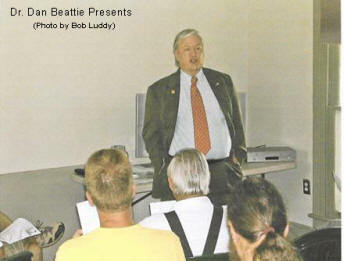 On September 24th, Joe McKinney led a fascinating discussion of the Battle of Yellow Tavern and the Death of JEB Stuart. Ably borrowing from his own independent research, Joe led the audience from the details of the fateful encounter to its placement within the larger scheme of late war Federal strategy. Do you like to meet new people? Do you know how to operate a TV & DVD player? Can you say “hello” in at least one language - English? If so, you have all the skills necessary to volunteer at the Graffiti House. If not, we can train you! As we transition to opening the house to visitors on four days each week, we need to double the number of volunteers. The Graffiti House had close to 1700 visitors through August and volunteers are really needed! Please contact Della Edrington at (540) 825-4543 or email Della at della_e@hotmail.com if you would be willing to help keep our house open this Fall. As reported in the last newsletter, the name of JEB Stuart has been found on a wall of the Graffiti House. What remains to be done is to determine whether the name is just that - JEB Stuarts's name - or whether it is actually JEB Stuart's signature. Some 10 examples of JEB Stuarts signature from the 1850’s through his death in 1864 have been gathered for the purpose of comparing them against the wall signature. Additionally, the wall name has been shown to several experts in the Confederate autograph field. Thus far, the jury is still out and no firm conclusion has been reached. If you have an interest in signatures, or an interest in JEB Stuart, or would just like to try your hand at CSI work, we would be interested in talking to you. Volunteers are needed!! For information contact us at (540) 727-7718 or email us at director@brandystationfoundation.com. Recently Father William Aitcheson of Warrenton, Virginia, graciously allowed the Brandy Station Foundation to display for the summer a rare relic from his collection. The relic was a pewter drinking flask which at one time was owned by Henry (Hal) Hopkins of Breathed's Battery of the Stuart Horse Artillery. It is the same Henry Hopkins whose name is the 4th listed name on the Maryland Scroll located in the rear upstairs room at the Graffiti House. While impossible to prove, it is possible that this very flask was in Henry's possession when the Maryland Scroll was drawn at the Graffiti House over 143 years ago. Thank you Father Aitcheson. On July 9th the Brandy Station Foundation was honored to have as our guest at the Graffiti House in Brandy Station, Mr. Robert Edward Lee IV. Bob Lee is the grandson of William Henry Fitzhugh (Rooney) Lee, and the great-grandson of General Robert E. Lee. Mr. Lee came to Brandy Station to sign the Wall of Honor at the Graffiti House in the names of his illustrious ancestors. Mr. Lee seemed as though the honor was his to add his name to the wall with the names of so many others who were on the field of battle. Mr. Lee was most gracious in speaking to the crowd of about 75 who gathered on this hot afternoon to meet him, many asking for autographs and pictures and asking him to sign books about his ancestors. One such request was from a young boy who came with his friends and his mother and presented his history book for Mr. Lee sign beside a picture of General R. E. Lee. On July 20, 2006, seven members of the Brandy Station Board of Directors and volunteer staff had the unique opportunity to visit the Blenheim House in the City of Fairfax, on Old Lee Highway. Blenheim is home to a wealth of Civil War Graffiti. Blenheim, open just one weekend a year to the public, was opened to us thanks to Susan Gray, curator of the Fairfax County Museum system. This 12-acre site, purchased by the City of Fairfax in 1999, includes a circa 1858 brick house and family cemetery. Once part of a large farm owned by several generations of the locally prominent Willcoxon family, Blenheim is on the National Register of Historic Places and contains the most voluminous and best-preserved examples of Civil War soldier graffiti in the nation. Another historic property, the c.1840 Grandma's Cottage, was moved to the Blenheim complex in early 2001. 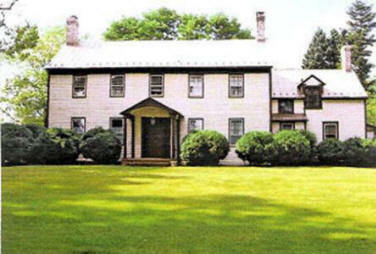 Both buildings are associated with the Willcoxon family, instrumental in the early-19th-century history of Fairfax. In addition to touring the house and its unique history, those in attendance had the opportunity to meet and have a detailed discussion with Kerstin Travers, a Conservation Technician contracted by the City to remove the layers of paint that have hidden the houses graffiti. The tour of the house lasted approximately three hours and included access to the attic, where the majority of the identified graffiti lies. Due to safety concerns, guests are not normally permitted their. The graffiti that has been discovered to date is all Union and dates around three specific time frames: March and April 1862, when the Federal forces occupied Fairfax for the first time; September 1862 to January 1863, when the house was used as a 11th Corps hospital; and during the march to Gettysburg. Over 100 names have been identified from more than 20 regiments. In addition to names, there are well over thirty drawings. Many are symbols, but there are also numerous drawings of ships, individual soldiers and a couple of 'suggestive' drawings. Recently discovered was a series of drawings and phrases written by a soldier depicting his life and feelings about service to his country and how, over time, his enthusiasm for the life of a soldier had waned. This set of drawings runs down a door frame on the second floor. There are interestingly, a number of drawings with pigs in them. The conversation with the conservator was also very informative. She worked on a variety of projects over her the years, her previous work before Blenheim was to help refurbish a Saturn V rocket in Houston, Texas. Kerstin showed us some the techniques used to safely remove the years of paint and how she identified specific target area where it was felt graffiti might be hidden. It entails, in part, applying a chemical stripper to small sections of the wall where it seemed that writing was hidden. She then uses water on a large (hand made) cotton swab to carefully remove the paint. It is tedious work, and Kerstin's pace is about a square foot an hour; obviously longer if there is writing underneath. The day ended with a discussion of the refurbishment status of Blenheim in relation to the status of the Graffiti House. Blenheim, with greater resources, is much farther along then we are. Their plans include a visitors and education center on the grounds, where full scale photos of the attic drawings will be displayed. There was also a discussion on the possibility of linking Blenheim, the Graffiti House and other known structures that have civil war graffiti, (in areas such as Harpers Ferry, Fredericksburg, Manassas and Front Royal) into a Civil War Graffiti Trail. HO HO HO!!! You are all invited to the 4th Annual Christmas Party to be held at the Graffiti House from 1:00-4:00PM on Saturday, December 9th. As was the case last year, good food, drinks and company will abound so all that you need to bring is yourself - and a few friends. This year, it is rumored that we will be visited by a special guest (straight from his assignment at Fredericksburg)! So mark your calendars, a good time will be had by all! A real treat awaits you on November 4th!! The First Stuart Horse Artillery will be present at the Graffiti House to demonstrate camp life as well as their prowess in firing and servicing their cannons. For the demonstration, which will begin at 1:00 PM, the members of the horse artillery will fire a 6 lb. bronze cannon and also a 3 inch ordnance rifle. Come on out and enjoy the show. The year 2008 will mark the 145th anniversary of the June 9th Battle of Brandy Station, the largest cavalry battle of the Civil War. To mark the occasion, the Board of Directors has endorsed the concept of an anniversary weekend, June 6th, 7th and 8th, of 2008. Although plans are not firm at this time, it is contemplated that every effort will be made to include all of the Culpeper community in the activities. If you would be interested in participating in any aspect of the weekend, please call the Graffiti House at (540) 727-7718 or email director@brandystationfoundation.com and leave your contact information. Come Home to Historical "Afton" Headquarters for JEB Stuart and his cavalrymen prior to the Battle of Brandy Station. This gorgeous historic home on 44 acres is a lovingly maintained and renovated 4BR 3BA home with a beautiful Parlor, Dining Room & Library, gourmet kitchen and spacious sunroom w/slate floor. Other features include an in-ground pool, paddock, some board fencing, vintage barns, tenant house, octagonal ice house & so much more! Call Janet Holden at 800-66-JANET X236 or 540-825-1613 or go online www.janetholden.com.